If you are a seasoned collector or just getting started, chances are you need a piece of furniture to display your collection and equipment. The best solution is getting your hands on a good record player stand, table, cabinet, or media console. 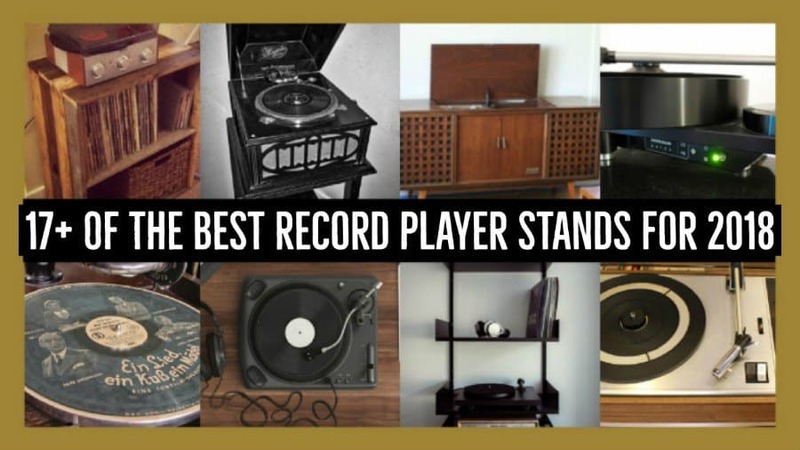 When it comes to choosing the best turntable stand, there’s a lot to consider. You want to give your records the recognition they deserve, protect them at the same time & have the best music experience possible. Here with our review guide, we’ll provide you with a list of some the best record player stands for 2018. Here’s a list of the best items from this guide that we’ve generated based on data from Premier Records. Click on the product name to jump to the review further down the page. The Line Phono Turntable Station is a unique and simplistic modern piece of furniture. 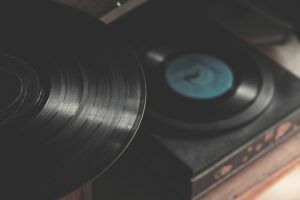 Since creating this guide in 2017, it has soon become one of the most popular names in the record player stands market. The simple, functional, versatile, quality and sturdy design with simple assembly make it many’s favorite turntable stand. It contains four levels with the top two tiers allocated for amplifiers and turntables designed to fit most systems. The bottom two levels are mostly for storing vinyl records, each with a capacity to host approximately 100 records (200 in total). It is built with MDF (speckling and color variation based look) and does not paint. Expect a purposefully chosen “matt” design to easily differentiate the Line Phono from other bland furniture designs on the market. The Line Phono is available in two colors: carbon (charcoal black) and Birch (light brown). The height of shelves can be adjusted; has a hook for headphones and multiple cable holes. This product makes storing lots of records and equipment without taking up a lot of space effortless. This furniture piece is from Darla’s Studio and is one of the most affordable handmade items on our list. The record stand follows a simple design and almost looks like two crates added on top of each other to make a vinyl storage unit. The wood is coated with a medium stain and can display about 60 vinyl (120 in total). You can now also get it in dark brown/black. This piece is good for a small to a medium collector or even someone looking for a small stand on a budget. Although it’s not a design record collectors might be familiar with, it has become a popular choice. This industrial design unit is sturdy, durable, and comes standard with two shelves. Initially, it was created as a side table for a bedroom. However, there is no reason why you can’t use it for your vinyl collection: vinyl below and turntable up top. The RPM Industrial Unit comes in a range of vibrant colors such as bright blue, orange, light gray and black as shown below. The Nexera Audio Tower Turntable stand is an affordable multipurpose audio equipment piece. It comes in 4 different color variations: American Beech, Biscotti and Black, Moka & Black, and Truffle. The one in the image to your right is the “Truffle” variation. Manufacturers make it in Canada and from particle board and MDF. It provides a good amount of storage space, and since the shelves are adjustable, you can slightly tweak it to fit your specific needs. The Nexera is a great option for someone starting out or with a low budget. This piece from Design 59 Inc is affordable, classy, stylish and compact. Sometimes you just want something small, affordable and maybe even temporary. The record player stand was designed in a typical Mid-Century Modern fashion crafted with beautiful Acacia wood. What more do you want if you’ve got a turntable and a few records to play? The Novogratz Concord is a retro piece of furniture great for using as a stand. It comes in brown, made with a combination of particleboard and MDF and includes black metal hairpin legs. The mid-century modern design looks amazing with a few records and music equipment on it. The four lower compartments are specially made to store albums and make sorting through a small sized collection easy. The Novogratz offers great value for money together with a lot of styles. You can also get it in white and double compartments. The Crosley Manchester Entertainment Center is perfect as an entry-level record player stand. The design contains a mix of simplicity, retro and modern elements. It’s made from wood and wire for record shelving and comes in Paprika (combination of brown and red). The bottom level is for vinyl storage (averaging 50 records). The wired slots prevent albums from falling out of the sides and makes sorting easier. The top level is a simple table top for displaying a turntable. The Crosley Manchester stand offers good value for money and can comfortably fit into almost any room design. The Winsome Shelf is the most straightforward and least unique item we have on this list. However, on Amazon, it has almost too many reviews to count. It has two shelving options and three levels for storing audio equipment. Traditionally the Winsome is not build with audiophiles in mind. However, it does seem possible to accommodate a turntable, amplifier and a few vinyl records. It’s a great value-for-money piece and yet another good option at the lower end of the market. The Crosley Brooklyn one of Crosley’s latest designs within the record player furniture market. It’s a fusion of metal and wood (pine) materials to create a modern industrial look. Facing the front, you can see the black Crosley logo that matches the black metal legs and frame. It only contains one level of audio equipment storage space with an area specifically designed for vinyl at the back of the item (separated by a wooden block). You can also find a small area underneath the unit for a speaker. This unit is open, allows for easy access and has a design unlike most products on the market. Having a custom colored, handmade record player table build especially for your collection is fantastic! If you have a bit more money to spend and love a vintage looking US-based handmade furniture created with quality materials, this Wicker Wood Works design will suit you well. With this stand, you can choose from 5 different wood finishes (vintage blue, dark walnut, red mahogany, ebony and gold oak). The record table stand has three levels with the bottom being allocated mostly to vinyl and the 2nd and 3rd levels a combination of space for records and audio equipment. In the product images, it is not shown to carry a turntable. However, it does seem able to fit most devices and can host up to 175 records. Keep in mind that it’s not an entry-level unit so be prepared to pay more. Overall the Wicker Woodworks unit does offer great functionality, lots of storage space and many design options which makes it one of a kind! If you want an entirely customizable product made especially for you, take a look at the DK Vinyl Displays stand. The designer works directly with you to create a product with the color scheme and paint you desire. The product itself is environment-friendly – made from high quality recycled commercial grade MDF. The design consists of a triangular shaped frame with two levels (lower for displaying vinyl). It even has small handcrafted side panels to prevent them from falling out and can store up to 400 records – perfect big-time collectors. The top level can display a turntable (will fit most devices). Alternatively, this level can also be used as an additional record storage space. DK Vinyl Displays designs many furniture products for the record industry. Be sure to visit their store on Amazon by clicking here. 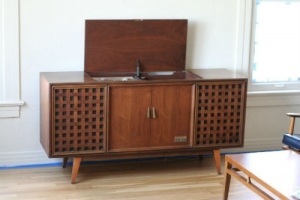 The Crosley Everett record player cabinet is a beautiful Mid Century Modern piece. It’s a small and compact unit with a lot of class and can even hold up to 75 albums. With the Crosley Everett, you can expect all your records neatly tucked away behind the cabinet door with your turntable on top. Some collectors like minimalist options like these where your vinyl isn’t blurted out in the open for the world to see. Your records also get protected from outside elements such as dust. The “Clifford” retro unit is a moderately priced and fantastic looking product with lots of storage. It’s a mid-century modern furniture design with a dual purpose. Not only is it meant for a music collector but also has room for everyday items such as books and ornaments. There is space for your record collection in the sliding door area below as well in the middle area and for a turntable on top. Materials used in manufacturing include birch veneer (brown) and scratch resistant metal legs. The Nexera 1-door audio tower a simple design stylish piece of furniture available in cherry and black. It’s a great contender in the lower end of the price range for the record player cabinet section (similar range as the Crosley Bardstown below). You might need to get a bit creative and remove one of the shelves to fit your vinyl collection. As with previous Nexera products, it’s made from MDF and particle board. Overall this small, compact, sleek and affordable furniture piece can be a simple solution. The Crosley Entertainment Cabinet is a straightforward and functional product. It’s made out of wood veneer, has a beautiful glass cabinet door (available in Cherry, Paprika, and Black) and is priced very reasonably. It comes standard with three levels of storage. The bottom tier is for displaying vinyl records while the top smaller section for CD storage. The top area, as with a record player cabinet, is for turntable display. The design might seem bland but will be easy to match with other furniture items in a room. The Pemberly Row media console is a beautiful piece of retro mix Mid-Century Modern furniture design. Materials used are solid hardwood, metal wire for vinyl record slots covered in a rich dark mahogany finish. This almost vintage record player console has the capability of neatly tucking away your turntable and audio equipment. The sliding cabinet doors are perfect if you’re not a fan of displaying your collection out in the open. There is room for the turntable inside the cabinet on the top level and wired slots for storing vinyl on the bottom level. Shelving is adjustable, leaving room for customization – a nice additional benefit. Keep in mind this product is now called the Crosley Everett Media Console. This media record console is a real classy item. Although it tends to be in a high price range, you’re paying for the unmatched retro design with significant storage and unique features like sliding & hinged doors. Simpli Home offers a range of quality furniture with expert build functionality and modern design often matched with classic tapered legs typifying the 1950’s / 60’s retro era. This product is not explicitly designed as a record player stand. As a media stand, it does offer many features a vinyl collector would need. The media console is made from solid rubberwood and has an Auburn brown, dark wood finish. Besides the impressive design and quality, it is also reasonably priced. It comes in 3 different sizes and designs respectively the “low,” “medium” and “tall.” With each separate unit, the price and height of design differ as well as the door and cabinet arrangement. Each version has multiple holes for cables, room for a standardly sized turntable and a vinyl collection. Shelves are adjustable and can be customized. Even though it’s not built with turntables in mind, it’s a versatile piece and big contender in the more prominent sized record player console category. Seeing as we’re done with the list, we’d just like to clarify any confusion between stands, tables, cabinets, and consoles. From our perspective, people often refer to each of these as the same thing when they are actually slightly different. 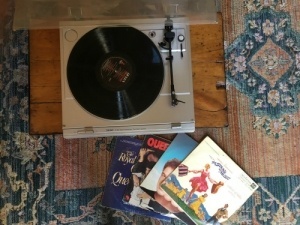 Record player stands and tables: Stands and tables are similar and mostly made of wood. Furniture in this category is mostly open. You can see what is on different storage levels. Record player cabinets: These items tend to be large but can vary in size. They can differentiate themselves from stands with the addition of drawers, doors and often with the option to conceal what is inside. Record player media consoles: These items tend to be big entertainment pieces to store all your music equipment and can even come with built-in speakers. Media consoles were trendy in the 1950’s where it was once the centerpiece of every bachelor pad. It’s tough to say the “X” is the best record player stand. Cheaper furniture will cost between $50 – $200 while more expensive items can be $200 – $1000+. In the end, you need to be realistic. Don’t expect to buy a $50 item and be able to display a collection of 1000 records. The higher the price, the more functionality, storage, better quality and better design. When it comes to choosing the best option for you, it’s really up to what you need and what you are willing to spend. With so many record player stands available on the market, it can be hard to find what you need. We know and understand every budget is different and that’s why we added items from under $100 up to over $1000. Remember to check dimensions of the equipment you own before buying and check product dimensions.